With the development of digital data supported by Artificial Intelligence, many experts believe that Smart Factory will be a new gold standard of industries. However, the information overload leads to confusion among the manufacturers. They do not really now the path to building a smart factory. 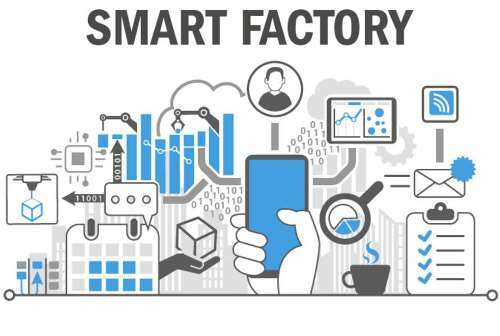 In a post on Forbes, Willem Sundblad notes that the smart factory evolution consists of four levels. Therefore, the manufacturers have to go thorough these paths to achieve their targets. Actually, Smart Factory is primarily related to data. In the past, manufacturers collected data by means of traditional methods, like performing root-cause analysis, using clipboards, or observation. However, the situation is different now. Manual process is neither relevant nor adequate to provide the manufacturers with the necessary data. As mentioned above, Smart Factory is about data. The first stage is available data. Despite availability, the data does not help much in decision-making process or in improving implementation. The problems include data silos, which require the manufacturers to integrate them into useful data system in a manual way. This certainly wastes time. Solving the silo data problem is possible, but it takes much time. It is also costly and consuming many resources. When the problems occur, the management has to gather data manually to find out the solutions. Therefore, manufacturers have to move to level two as soon as possible. Otherwise, they can waste much money due to lost productions and repeated downtime. In other words, the first stage is actually status quo. The manufacturers do not have many choices to integrate the available data into the decision-making process. The next stage offers the solutions. To move to this stage, the manufacturers need to build a new data architecture. This process may take few months. They can choose to build their own system. However, if human resources in IT are limited, choosing one from the list of solutions offered by the providers or partners can be the best choice. Stage #2 solves the problems of disparate data sources. The system integrates them into a single database, gathers data, and tracks the data production in a continuous way. When the data is always available at a single location, problem solving becomes easier. However, the stage #2 still has some limitations. It may takes time, energy, and resources to anticipate the problems before they really occur. In other words, proactive analysis is still difficult. Therefore, the manufacturers have to proceed to stage #3 to address the problems related to proactive data management. Stage #3 and #4 are addressed in the next post.